Since Nathaniel Hawthorne famously complained about the “damned mob of scribbling women” in 1855, much has changed in American literary and popular culture, not least the nation’s racial demographics, which now include substantial numbers of Asian Americans, as well as other people of color. And yet, the significance of women’s popular fiction continues to be overlooked, if not derided outright, by many social and cultural critics. 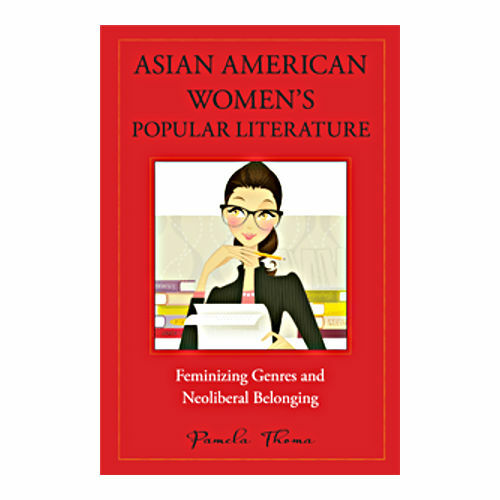 Fortunately, feminist scholars have sought to rectify this state of affairs, and Asian American Women’s Popular Literature by WSU associate professor Pamela Thoma is a lucid, convincing, and original contribution to the field. Despite the remarkable commercial success and cultural visibility of Asian American women’s popular fiction, Thoma’s is the first critical study of genres such as the ones she considers, for example, Asian American women’s “labor lit” or the Asian American female detective novel. As such, Thoma also challenges the commonplace lament regarding the relative invisibility of Asian Americans in popular culture. Instead, by considering a range of authors, including Amy Chua (of the infamous “Tiger Mother” debates), Sonia Singh, Suki Kim, and Ruth Ozeki—to name only a few—Thoma follows more recent scholarship in Asian American studies that carefully considers representations and cultural politics deemed to “accommodate” or to be “complicit with structures of power,” in order to understand what they might tell us about racial, national, gender, and class formations in the current historical juncture. In this study of “feminizing genres and neoliberal belonging,” Thoma examines how contemporary novels, authored by Asian American women, negotiate conditions of cultural and political belonging under what political economists call “neoliberalism.” Thoma perceptively describes citizenship, in particular “cultural citizenship,” as an object of contest, transformed by political struggle, cultural production, and economic activity. While Asian American women are permitted to pursue belonging according to the exacting, market- and consumption-oriented mandates of neoliberal ideology, she argues, they also participate in a critique and remaking of the terms by which cultural citizenship is granted. Finally, an especially appealing aspect of Asian American Women’s Popular Literature is the strong case it makes for the ongoing study of print culture and the novel form in its many permutations. At a moment when scholars of popular culture seem increasingly to forego such literary forms for other media, Thoma reminds us that “the book is now more socially influential than it has been for some time.” There is much critical pleasure to be had in Thoma’s serious treatment of novels that are often dismissed as (only) pleasure reading. Crystal Parikh is associate professor of English in the Department of Social and Cultural Analysis at New York University and author of An Ethics of Betrayal: The Politics of Otherness in Emergent U.S. Literature and Culture.